Executive chef Enzo Febbraro offers an authentic, rustic style of Italian cooking. : Executive chef and Naples native Enzo Febbraro brings authenticity and his rustic recipes to Allegro. 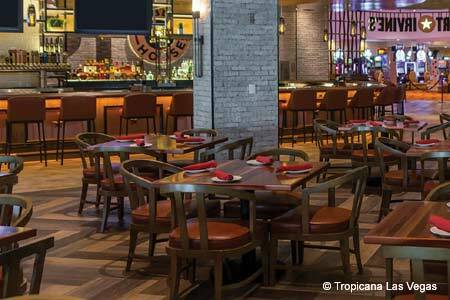 The lounge area opens to the casino, while the dining room provides a quieter experience. Wynn Las Vegas’ red theme is continued through the red carpet and red leather chairs, and an open kitchen adds to a lively ambience. Begin with the crispy calamari and shrimp with cherry peppers and a spicy tomato sauce, or a wood-fired Bianca pizza --- a cracker-thin crust topped with mozzarella, prosciutto, arugula and shaved Parmesan. We also like the risotto pescatora with shrimp, scallops, calamari, mussels and clams cooked in lobster stock; and the seasonal pumpkin risotto served in a small pumpkin with seeds and amaretto cookie and made extra creamy with mascarpone. Meat lovers will appreciate the generously portioned 18-ounce rib-eye with roasted broken garlic rosemary potatoes and balsamic reduction, and non-carnivores will be happy with chicken francaise with a bread-crumb crust, pan-fried with capers and citrus butter. As with all Wynn restaurants, a portion of the menu lists vegan dishes, such as the organic ancient grain penne with garlic, basil, cherry tomatoes, zucchini and asparagus. Finish with rum baba, rum-soaked sponge cake with citrus-infused syrup and vanilla whipped cream. While 180-plus wines mainly from Italy, France and California are available, special requests can be procured from the resort’s vast wine cellar, offering an inventory of several thousand. A late-night menu is served until 6 a.m.